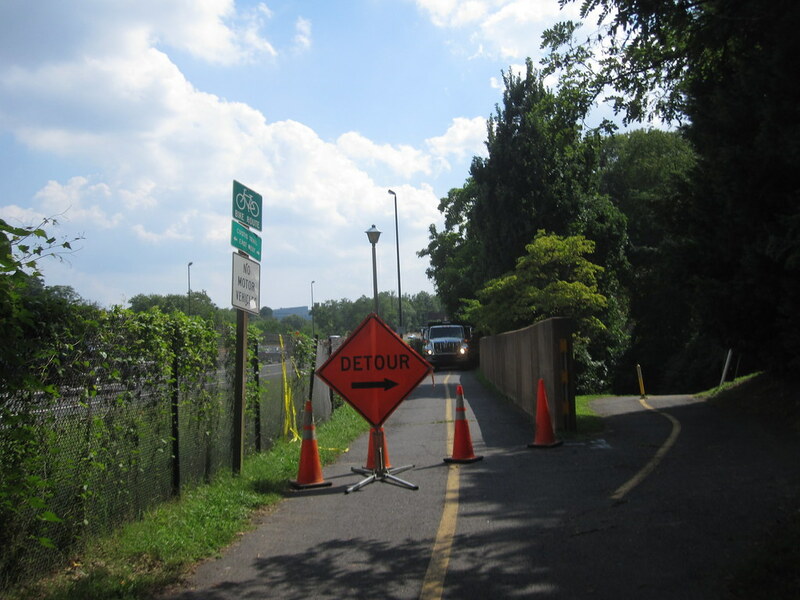 This from Arlington County: The Custis trail under I-66 (between Westover and Bon Air Parks) will be closed overnight, four nights in a row, so that a protective framework can be installed to protect users during the upcoming widening of the vehicular bridge. The trail is scheduled to be closed between 9 p.m. and 5 a.m., Monday-Thursday, August 23-26. This morning the work was done, the pavement was pristine and the line was painted perfectly. Great job by those doing the work. I won't miss the steel plate. My jingle bells will ring a little less. Actually, I think the work is planned for further west on the trail (the underpass beneath 66, not far from the where the Custis meets the W&OD). Probably can use the same detour that was set up a few years ago when that section was closed before. Coolness. Good to know. I'll keep an eye out as I head to work tomorrow morning. The I-66 spot improvements are going on all the way from Ballston to past Sycamore St--the original posting is correct. If it doesn't rain and I can get out to ride, I'll post a head's up as to the exact locations of the closing(s) and any detours. From the map/link Tim provided, it does indeed look like that section will be shut down beneath 66 and everyone will be re-routed to a well-lit, very easy to navigate detour via the pedestrian overpass. And here's the latest update I've gotten from the Trails Manager, "The detour signs are in place for the Westover Underpass. Our ranger unit will move traffic barrels and additional signage into place around 8:30 pm when the detour is in effect. Our trail crew will remove the blockades in the morning around 7 am." I saw the cones and detour signs this morning when I rolled through at 0600. They were done with their work. The machinery was parked at the side and the Custis was open. The location is the Western terminus of the Custis trail... Right at the point where it connects with the W&OD. I'll document it photographically tomorrow. I was distributing reflective gear this morning and didn't have a spare hand to hold the camera. I used the detour this morning, and found it pretty well marked/decently lit. Not too much of a diversion from the normal route. The construction crew had the underpass glowing w/klieg lights---surreal! From the pedestrian overpass (detour) above 66, you could see them working on the top of the bridge. Cool! I'm actually looking forward to checking it out tomorrow. I missed it today since my commute took me in the opposite direction.